We agreed to do our interview at 2 p.m., I wanted to arrive early but give her enough time to prepare so I knock on her door at 2:05. She opens the door, saying: “Oh my god it’s a miracle! A punctual Puerto Rican!” Don’t worry, she’s Puerto Rican so it’s OK. 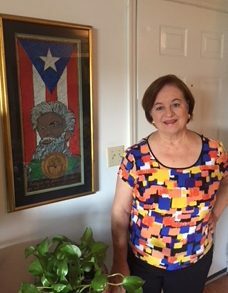 The Seminole Scribe had the chance to talk with the daughter of famed Puerto Rican composer Sylvia Reach, who is also known as a theater and soap opera actress. Scribe: Could you explain who your mother was for people who don’t know she is? Scribe: How influential do you think your mother was? Could you name some examples? Reach: Even though she only composed 50 songs, she was ahead of her time. An example would be with her lyrics. She would tell a story from beginning to end with her lyrics, and talked about love in a whole different way. We’re in 2018 and her music is still interpreted by a very young generation, we call them ‘Sylvistas.’ One of the group is called Miramar, and also Leonel Villahermosa which is the ‘Sylvista’ in charge of making her music known with the new generation. Scribe: I read that when you were little your mother used to make like a circus and would act like a lion, do you have any other sweet or nice memories about your mother? Reach: Well yes, what happened was that she had three kids. My brother Billy, myself Sharon, and my little sister Sylvia. Like all little kids we would go, “Mommy, Mommy I’m bored. I want to do something.” She would say, “get all the mattresses and sheets from your beds, put it on the floor and get your bathing suits on.” We would tie the sheets on the, they would call it in Spanish “soles truncos” of our house and make a carp. Then we would have to do acrobatics, get on top of each other, tumble over, do an animal, my mom would do like a clown. We would do that for hours. I can tell you a lot of stories like that. Scribe: I read that you would be around when your mother hung out with artist friends where they would touch on topics like war, politics, homosexuality, etc. and you would sit down and hear them talk, any memorable moment concerning that? Reach: They would be in the dining room and they would play guitar, drink, make jokes. They would gossip too (laughs). Here I was 8 or 9 years old and I would hear them talk about these adult things. Later, I would ask my mom about it and she would explain it in a way where I would understand it, while also giving the moral. For example, one time they were talking about the musicians going on strike, and I would ask what if somebody has to go through the picket line and work. She explained that you don’t ever do that because they are fighting for their rights and you always have to respect it. As soon as I saw a picket line I immediately remember what my mother taught me, and I never crossed a picket line in my life. Scribe: To many people your mother is one of the most influential composers in Puerto Rico, but did you always see your mother as just your mother? Was there ever a time when you realized that oh my mom is Sylvia Rexach? Reach: It’s funny because I thought all moms were like my mom. Crazy, Bohemian, drinker and smoker. She would go to a cocktail lounge when women weren’t supposed to do that. She would also never iron my uniform or make breakfast in the morning. Then I saw one of my friend’s mom, and I realized my mom was different. I would never change a thing about her, despite that the way she lived with her life. Scribe: Your acting debut was in the show “La Taberna India,” how did you end up in that show? Scribe: In “La Taberna India” you worked with Ramon Rivero “Diplo” who was an influential figure in Puerto Rican comedy, some even calling him the Puerto Rican Charlie Chaplin. How was it working with such an influential person? Reach: Diplo was one of the best comedians we ever had. He belonged to the actor’s union and was very committed. From him I learned about defending and fighting for the rights of the actors, he was also a good friend of my mom. He was an excellent comedy actor and also in drama. Every time we acted together it was like taking a class since he would always give me advice. I remember when I was in third grade I won a gold medal for the best child actress. Months later he passed away. I went to the funeral with my mom and decided to put my medal in his suit lapel. He was buried with it. Scribe: Your mother died of cancer when she was 39, how was it losing your mother at such a young age? Reach: It was hard to lose her in my teenage years when I needed her the most. Later, I realized that all those times that she sat me down to talk to me was because she was preparing me for when she was gone. For example, we used to live in Santurce in a second story house there were some stairs leading up to the second floor. At the bottom of the stairs lived a homeless man. He would sit, sleep and wake up there. He would then move but he always came back at five every day. His name was Juan Vaca, “John the Cow.” I don’t know why he had that name. My mom would cook and the first person to eat was Juan. She would make me go down the stairs get his can and spoon. I would clean it then my mother would put all the food in there and I would give it to him. At that age you don’t like it, but then you grow up and you realize, wow she was teaching me a lesson. Now when I find a homeless man I try to give him food. Scribe: In 1965, you went back to Puerto Rico to study drama, one of your teachers was Dean Zayas who was a prolific theater director. How influential was he to you and the Drama Department at that moment? Reach: This this how it went. I came back to Puerto Rico and my family said you are going to be a secretary. I said OK, but I was thinking, I don’t want that, why would I do that? I went to speak with a counselor and they gave me a test to check what my intended vocation was. When she came back she said that everything shows that you have to study something related to the arts but I still wasn’t sure. That first November 7 of 1965, which is my birthday, I was at the student center at the University of Puerto Rico where Dean Zayas spotted me. He knew my mom briefly. He approached me and we started talking. I told him that my aunt wanted me to be a secretary but I wanted to be an actress. He told me that he was teaching at the drama department, and maybe the next year I could become his student. That was the best gift I’ve ever gotten. He became my mentor and would direct me in the many of the successful plays in which I would feature. Scribe: You were part of a theatre group “Teatro del Sesenta,” how was it working with all those people? Reach: You had to be invited in the group …. We did a lot of plays, we opened a theater in Puerta de Tierra which we called Teatro Sylvia Rexach, also with Dean and Tutti Umpierre, a musician and my mother’s best friend, we went to all the cultural centers to play my mother’s songs. We were a group full of energy and creativity. At that time in Puerto Rico was flourishing with theatrical groups. It was a moment in history. Scribe: After working in a couple plays you went and started working on soap operas like “Natacha,” what made you go from theatre to soap operas? How would you compare the experiences? Reach: Theater doesn’t pay, let’s start with that. The soap operas were a sure salary that I could pay the bills with. Panamericana Television contacted me and asked if I wanted to be part of a new soap opera they were going to do in Peru called “Natacha,” which was a big success and a great experience. The difference is that TV was impersonal since you act to a camera. Whereas theater there’s the audience that you can almost hear their heartbeat and when the curtain opens the emotion the actor feels is totally different. Scribe: How fun was it being in a soap opera? Reach: “Novelas” always have a diagram. It might be Sleeping Beauty, Pinocchio, they’re always based on the old kid’s stories. There’s the good girl, the bad girl, the prince, they always have the same structure. Some of them were of course “cursi” or cheesy but some of them were excellent. It’s a style that has developed for example in those times certain things were taboo. There was this super popular soap opera called, “El hijo de Angela Maria,” where I played the villain, which I loved since I always played the good girl and the villain also had motivation. Towards the end of soap opera, for the good girl to marry her love, my character had to die but I went to the producer and said, “I don’t want to die; why don’t we have a friendly divorce.” The producer goes “what!” It has never been done before. She was resistant towards the idea but at the end we did just that. I didn’t die in a car crash or ask forgiveness which was so cliché. Everybody loved the solution, and I was really pleased that I didn’t die. It was the first time an amicable divorce was aired on Puerto Rican television. Scribe: You did some shows at the legendary night club “Ochos Puertas.” What was a normal night at “Ochos Puertas”? Reach: A normal night would start at 10 p.m. The guest artist would have the first show at 12 a.m. then the 10 p.m. group would leave and another group would come in. I would keep going on like that until 5 a.m.
Scribe: What are some memorable stories about “Ochos Puertas”? Reach: When the governor of Puerto Rico Luis A. Ferre was in his home “La Fortaleza” to go to his meetings, he would have to go and pass “Ochos Puertas.” Many people don’t know this but he was a great pianist. In a slow night of the week he would come in with his entourage and security and play the piano. He would play a “danza” or something beautiful then leave. That was funny, seeing the governor and just relax for a moment and leave. He was a great gentleman and had a wicked sense of humor. Scribe: Then you became a mother with your daughter, Sylvia, and had some complications while giving birth. Could you explain the complication or the condition with your daughter? Scribe: How did your life change with your daughter? Reach: I retired 10 years in the peak of my career just to take care of her, which I don’t regret at all. It was constant attention, I traveled with her to Philadelphia, to the institute for the achievement of human potential. There I learned how to work with Sylvia with therapy that allowed her to finally walk. I sued the (delivery) doctor which took 17 years, but we won. Scribe: How has your daughter progressed? Reach: She has progressed but to a certain point. They said she wouldn’t walk, but we proved them wrong. Now she’s a 44-year-old (who) uses a walker and has some difficulty in her speech but nothing we can’t handle. She acts and feels pretty normal and is a very happy young lady. Scribe: After spending time with your daughter, you came back to your career and ended up acting in “Hasta el Fondo del Dolor,” the story was based on Sylvia Rexach. How important was it for you? Was it ever strange interpreting your mother? Reach: It was quite an experience living her life. What we did was this. The actress Adamaris Lopez played as me Sharon. We went to a psychologist friend of mine, Pepito Marcado. In that moment I had to give to Adamaris Sharon and all of her experiences so I could take Sylvia Rexach, my mother so I could interpret her. It was cathartic as an actress and a daughter. At first I didn’t want to do it but then I agreed but I wanted to do it the way it really was. People thought that my mom composed her music dressed in a beautiful white dress under the “Flamboyan” tree. No. My mother wrote her songs with a “Cuba Libre” in her hands, and a cigarette at 3 a.m. I wanted to include a thing that nobody ever thought I would do. My mother was a victim of domestic violence by my father which I saw when I was a little kid. In those times there were no laws against domestic violence. The police would come say it was fight between husband and wife and that’s it. They divorced, thank God. Scribe: After living in Puerto Rico for most of your life you went to Florida and also founded your own acting school “El Escenario.” How was that experience for you? Reach: First of all, I wanted my daughter to have the experience of living on her own, so she ended up living in a group home. After a year, she decided that she didn’t want to live there anymore, we ended up being roommates. I had met Roberto Perez in Puerto Rico and with Aurora Davidovich we founded “El Escenario.” We had acting workshops for three years. Then something happened. 9/11 happened, people stopped registering. By December, we had to close the school. Scribe: After the theater company ended, you became a teacher for students with disabilities. From your experience of working with kids with disabilities, what do you see that they needed the most? Reach: I wanted to keep working after “El Escenario” ended, I went to the Orange County Public School and applied as an aid to teachers who serve children with disabilities. I was hired and started with kindergarten, then first grade, then middle school and finally high school. After 15 years I retired. There was a child, at that time in sixth grade, who has Down syndrome. His parents wanted him to be in the regular classes, they wanted him to have the experience of regular classes. I was his shadow and helped him in his classes. In my opinion, I think they need to live a normal life and not be treated like a special case. It will help the people with and without disabilities since we are working on their sensibilities and compassion. Scribe: Working so much time in the theater, what do you think of the current state of theater? Reach: Depends on where you live. In Orlando there is a lot of theaters who do a lot. Right now there is an effort to do Spanish theater but it’s hard since it’s very expensive to rent theater these days. They charge a lot for rent, so imagine how much we have to charge the public. I think there should be subsidies for all the groups who are starting doing theater since it’s the only way the theater would grow. I think more can be done in order (for) theater companies to afford the space needed. Even though tragedy striked in Puerto Rico, there has been a big renaissance of writers. Plays, books, poetry, music, and they are just amazing. I’m pleased that, despite everything, this young generation has kept the art going, which someone has to do it. Please, please help them. Scribe: Have you retired from acting? Reach: My drama teacher taught me actors don’t retire. They die.